Group Theory in Quantum Mechanics: An Introduction to its Present Usage introduces the reader to the three main uses of group theory in quantum mechanics: to label energy levels and the corresponding eigenstates; to discuss qualitatively the splitting of energy levels as one starts from an approximate Hamiltonian and adds correction terms; and to aid in the evaluation of matrix elements of all kinds, and in particular to provide general selection rules for the non-zero ones. The theme is to show how all this is achieved by considering the symmetry properties of the Hamiltonian and the way in which these symmetries are reflected in the wave functions. This book is comprised of eight chapters and begins with an overview of the necessary mathematical concepts, including representations and vector spaces and their relevance to quantum mechanics. The uses of symmetry properties and mathematical expression of symmetry operations are also outlined, along with symmetry transformations of the Hamiltonian. The next chapter describes the three uses of group theory, with particular reference to the theory of atomic energy levels and transitions. 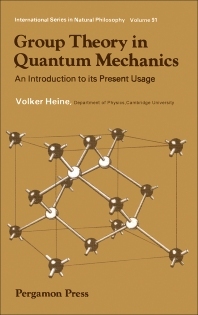 The following chapters deal with the theory of free atoms and ions; representations of finite groups; the electronic structure and vibrations of molecules; solid state physics; and relativistic quantum mechanics. Nuclear physics is also discussed, with emphasis on the isotopic spin formalism, nuclear forces, and the reactions that arise when the nuclei take part in time-dependent processes. This monograph will be of interest to physicists and mathematicians.